Lisa Lebofsky is a painter residing in Bronx, New York. Her paintings on aluminum explore the limitless capacity of the mind when it engages with nature. She holds an MFA in painting from the New York Academy of Art. Lisa finds inspiration and collects source material by traveling extensively to immerse herself in different natural environments. 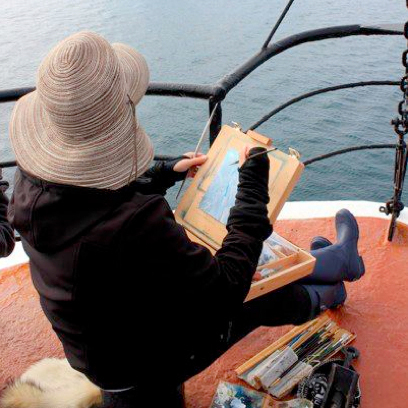 She primarily paints onsite, but also takes digital photos to cultivate a library of images for studio work. Recent travels include Tuscany, Antarctica, and Greenland. This past fall she joined a group of artists on an excursion to the Maldives to produce a body of work examining the affects of rising sea levels. She is the recipient of several awards and residencies including the Prince of Wales Scholarship travel grant to the Château de Balleroy, France (2005), the Terra Nova National Park Artist in Residence (2010), the BRIO (Bronx Recognizes Its Own) Grant from the Bronx Council of the Arts (2010), New Bedford Whaling Museum artist in residence (2013) and the Saltonstall Artist in Residence (2014). Her work is in private collections, and has been exhibited in solo and group shows both nationally and internationally.